My first stab at quilting was enough to send me for quilt lessons. One of our local shops, Earthly Goods, offers a series of classes and calls it their "Degree" program. After taking them, I became a "grad" and a member of their grad club. I put this page in a plastic page-protector sleeve on the left. On the right are the clippings, photos, etc. That means that the record page for the next quilt becomes a white background for the inserts of the previous one. This all takes a bit of time, but is quite satisfying to go through and see the progress. Of course the goof-ups are in there too, but I often need to be humbled. 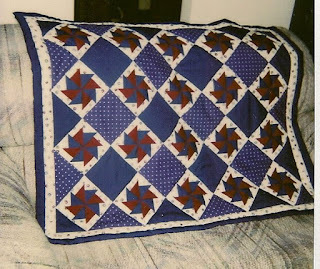 Here is a photo of the quilt that the page describes. It was from an instamatic camera so I had to scan it. Not too sure about the color! Also, many of the quilts done since then do not have the same details as this one. I don't keep track of the time now, but often make comments about the fun I had (or not) making the quilt. Thanks for sharing this Elsie! 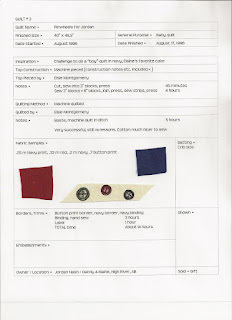 I love the idea of tracking all the details of the quilts I have made. I consider myself lucky if I manage to take a picture of a quilt when I finish it! LOL I need to start some sort of system like you have shown here. Thanks so much for sharing your journal! I am relieved you no longer keep track of the time, I just couldn't do that. I have a start at a journal, also in plastic sleeves in a notebook, but it's not as complete as yours. I have tried to at least photograph every quilt, as I give most of them away. Amazing. Far more detailed than I will EVER achieve, but very interesting! Great record keeping. I have a record of all my quilts that I've made over the years and it is so satisfying to browze through and take a peek at my quilts from the first to my last one. Love the quilt that you showed.